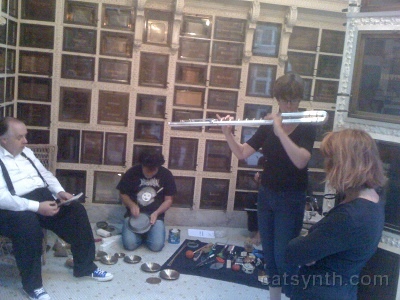 We passed another summer solstice a couple of weeks ago, and once again I marked the occasion by attending the Garden of Memory performance at the Chapel of the Chimes in Oakland. For more views of the Chapel of the Chimes itself, please visit the review from last year. It is full of light and a mixture of large and intimate spaces, and a really interesting place to wander and hear different sounds. The size of the event itself can be a bit overwhelming, with so many performers and galleries throughout the complex. One approach is simply to wander and discover the different spaces and music. But I tend more towards trying to go through the entire space systematically and see as much as possible, which I did with some success (I did unfortunately miss several performances). Just like last year, I was greeted at the entrance by a performance by Jaroba and Byron Blackburn. Jaroba again had a gopichand in his collection of instruments. In the main chapel, I saw performances by Sarah Cahill and the William Winant Percussion Group. I thought the latter sounded a bit like Philip Glass with its repetitive patterns, pentatonic scales and harmonies, and marimba rhythms. At the end of the performance, I found out it was in fact a piece by Philip Glass. My favorite moment during their performance involved Tom Duff singing God Save the Queen set against cymbal resonances and a perfect fourth by a tone tube (I forget the formal name) and Polly on bass flute. In the previous two photos for the Goodhart installation and Gino Robair’s ensemble, one can truly get a sense of the setting. Each of the squares in the grids represents the location of cremated remains, someone’s final resting place. I tend to be drawn to metallic sounds, so a next followed the hall to an installation Loving Kindness by John Bischoff. Although this was a computer-controlled electromechanical piece, with motors affecting the sound-making objects, it reminded me musically of Stockhausen’s Kontakte (a favorite piece of mine). 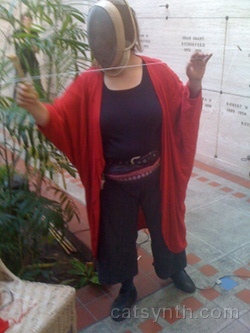 I did also notice the “live knitting”, which was an integral component of the performance. Tucked away in a small chamber and easy to miss was an installation by Joel Colley featuring a macabre set of animal skulls atop stones, with ambient sounds in the background. Over the course of four hours, it is not surprising that some performers will need to take breaks. It did mean I missed a couple of interesting performances which did not publish specific times. Pamela Z did publish performance times, so I did get to see part of her performance with the iPhone Ocarina application. Michael Zbyszynski performed more traditional wind instruments, flute and saxophone, but with modern extended techniques mixed with jazz idioms, in the Chapel of Resignation. Nearby, in one corner of the main atrium, Thomas Dimuzio and Wobbly performed on guitar and live electronics, respectively. 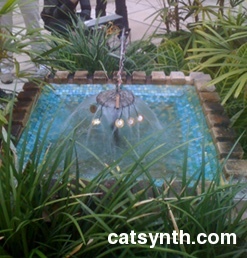 The music unfolded as long ethereal sounds with strong resonances, and some bowed metal sounds as well. In a nearby room was a performance by the ensemble Vorticella. We previously reviewed Vorticella, which consists of Krystyna Bobrowski on horns, Erin Espeland on cello, Brenda Hutchinson on aluminum tube and vocals, and Karen Stackpole on percussion, as part of the Flower Moon concert. Once again, the four very different performances produce a rich and complex music. Upstairs, I caught part of a performance by the ensemble Natto, which featured electronics, flutes, strings and a Chinese lute (I believe it was a pipa). The music consisted of heavy strumming, electronic “wipes”, harmonics on the wind instruments and resonances and delays used for pitch effects. In the upstairs section of the main atrium was a continuous vocal performance by the Cornelius Cardew Choir of Pauline Oliveros’ Heart Chant. The audience was invited to participate. The upstairs of the atrium is also the place to arrive during the climactic moment of the evening at sundown. As sundown approaches, everyone is invited to ring bells – many people rang keychains. 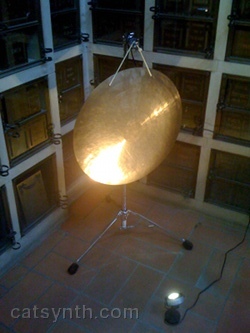 There was an interesting timbral and spatial juxtaposition of the sunset bell-ringing and Dimuzio’s and Wobbly’s drone sounds on the lower level. The theme of bells and metal sounds continued as I left after sunset, passing a set of large chimes that seemed to mark the end of the event. 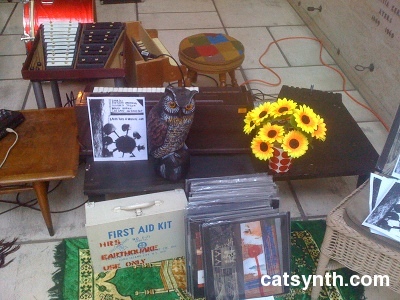 Posted on July 3, 2009 September 21, 2010 by catsynth	This entry was posted in Music, Reviews, Synthesizers and tagged amy x neuberg, byron blackburn, chapel of the chimes, cornelius cardew choir, crank ensemble, electronic music, experimental music, garden of memory, gino robair, jaroba, joe straub, joel colley, joel davel, john bischoff, karen stackpole, maggi payne, matthew goodhart, michael zbyzynski, natto, oakland, pamela z, paul dresher, performance, polly moller, review, sarah cahill, svetlana voronina, thomas dimuzio, tom duff, vorticella, william winant percussion group, wobbly. Bookmark the permalink. Wow. Sounds like the place to be. All those performances and art displays. I like the water fountain.